I've been using the free version of this plugin for ages and it does the job perfectly. Many thanks to the authors. Facebook plugin is the best social media solution which adds Follow, Like, and Share buttons to your WordPress website posts, pages or widgets. This is a great way to receive positive feedback from your visitors, earn media exposure, and consumer validation for your brand. 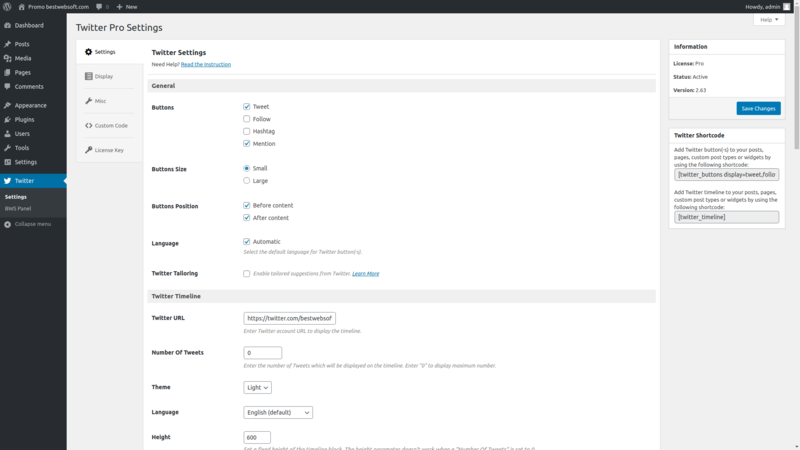 Customize the appearance, configure settings, and enable other advanced options to get more social traffic to your website and keep your visitors involved! Easy for a non computer nerd! Just what I was looking for. Easy to install and set up - it took me only 5 minutes to get it up and running! I even wanted to tweak the design a little bit and the customer service replied to my query with some CSS code in under half an hour - fantastic! * NEW: Ability to display the posts with the greatest number of Facebook likes has been added. 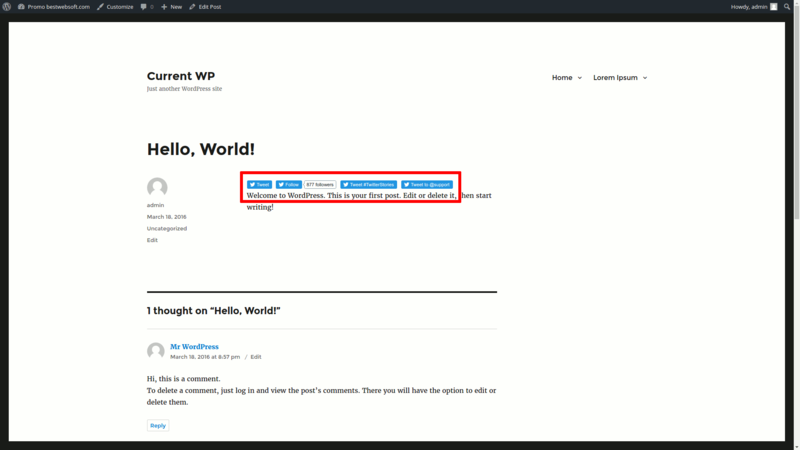 * Update : All functionality was updated for WordPress 5.1.1. * NEW: Ability to disable Meta Tags has been added. * NEW: Ability to enable Facebook buttons for archives has been added. * Bugfix: The compatibility with Custom Admin Page plugin has been fixed. * Bugfix: The compatibility with Graph API v3.2 has been fixed. * Bugfix: Bug with incorrect Facebook buttons displaying has been fixed. * Bugfix: Bug with incorrect Facebook buttons preview has been fixed. * Bugfix: Compatibility with Graph API v2.12 has been fixed. * Bugfix : Bug with incorrect Facebook buttons displaying has been fixed. * NEW : Ability to change buttons align has been added. * NEW : Ability to change Facebook App ID has been added. * Bugfix : Options removal from the database when working on a multisite network have been fixed. * Update : The Czech language file has been updated. * NEW : Ability to choose buttons size has been added. * Update : Default button appearance has been updated. * Bugfix : Bug with incorrect My Page Facebook button link was fixed. * NEW : Spanish language file is added. * Update : Images size for meta property ‘og:image’ has been changed. * Update : The plugin prefix was updated. * NEW : Ability to add custom styles. * Update : All functionality for wordpress 4.5.1 was updated. * NEW : Ability to change meta tags (image and description). * Bugfix : The conflict in the RSS feed was fixed. * Update : All functionality for wordpress 4.4.2 was updated. * NEW : Hungarian language file is added. * NEW : We added ‘Show Faces’ option. 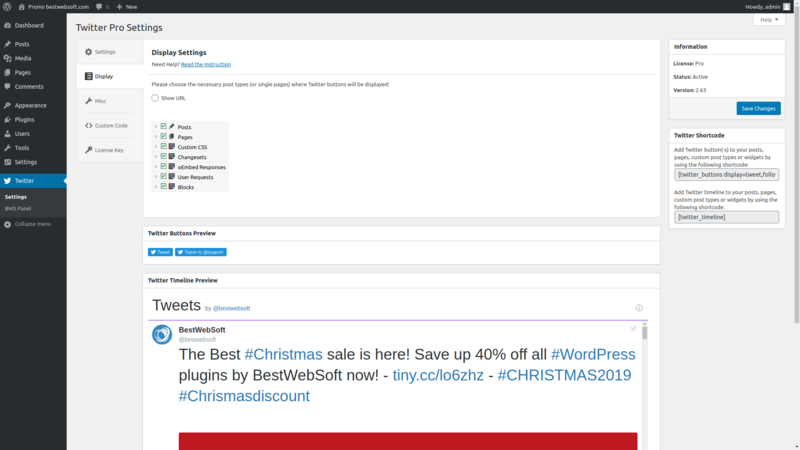 * NEW : We added ‘Button layout’ option. * NEW : We added ‘Layout width’ option. * NEW : We added ‘Like button action’ option. * NEW : We added ‘Color scheme’ option. * NEW : We added button preview. * New : Option to display the button in excerpt. * Update : We added buttons displaying for the excerpt. 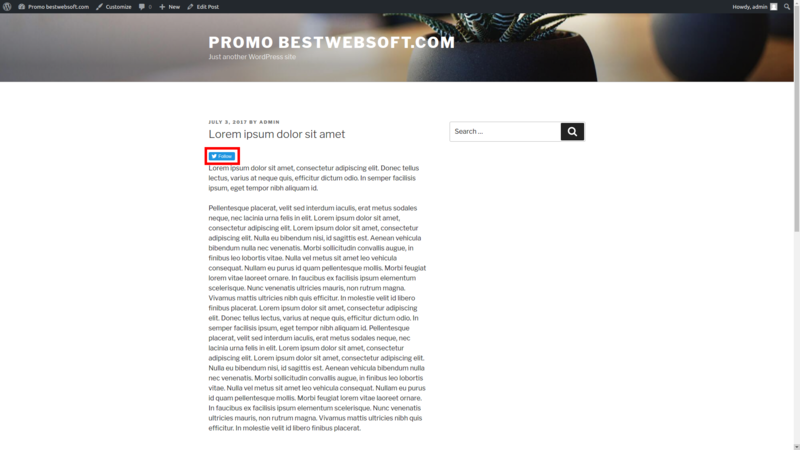 * New : Ability to use the current site language for Facebook buttons (Using Multilanguage by BestWebSoft). * Bugfix : We fixed the ‘share’ button displaying bug (when the shortcode is used). * New : Ability to restore settings by default. * Update : Button styles are updated. * NEW : We added the functionality to configure Facebook Like Button Pro on the Network. * NEW : Ability to “Like” an entire site, with this “Like” displayed on each page. * NEW : The Turkish language file is added to the plugin. * Bugfix : Problem with custom images after updating plugin was fixed. * Bugfix : Problem with showing Like button was fixed. * New : Share button was added. * Bugfix : Problem with switching user was fixed. * NEW : Tree of site pages was created. * PRO: Ability to display the posts with the greatest number of Facebook likes has been added. * Update : Ability to use the current site language for Facebook buttons (Using Multilanguage by BestWebSoft). * Update : We updated option titles on the Settings page for the convenience of users. * Update : Scripts were placed into a separate js file. 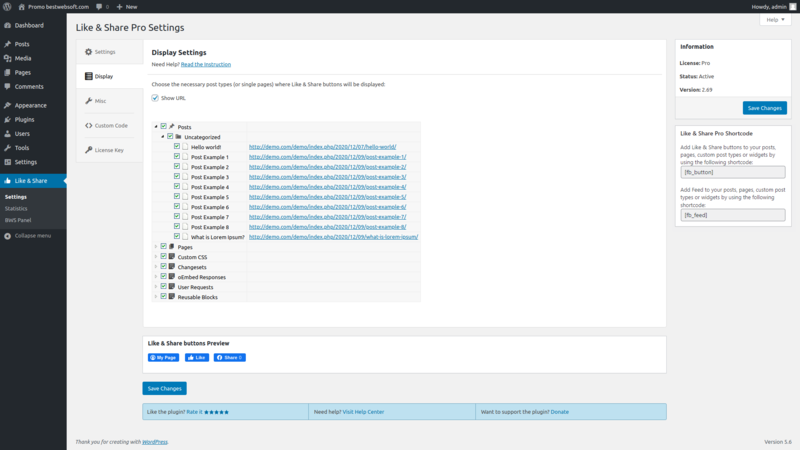 * Update : We updated all functionality for wordpress 4.0-beta2. * Update : Plugin tabs is added. * NEW : Html5 version of Like button is added. * Bugfix : Problem with blinking of Like button is fixed. * Bugfix : Problem with getting wrong thumbnails when putting Like is fixed. * Bugfix : Problem with language of Like button when using shortcode is fixed. * NEW : The French language file is added to the plugin. * NEW : We added posibility to add images with png extension as custom image for My Page button. * Update : New default image for the My Page button. * Update : The Indonesian language file is added to the plugin. * Update : We updated our screenshots. * Bugfix : Problem with styles is fixed. * Bugfix : Problem with undefined variable post_ID for multisite fixed. * Update : The Ukrainian language file is added to the plugin. * Bugfix : The error related to creation the path to the Facebook button image is fixed. * NEW : The English language is updated in the plugin. * Bugfix : The bug of displaying icons in the admin menu is fixed. * Update : We updated CSS file. * NEW : The Persian and Serbian language files are added to the plugin. * NEW : The Arabic language file is added to the plugin. * Bugfix : Cross Site Request Forgery bug is fixed. * NEW : The Hebrew language file is added to the plugin. * Bugfix : The bug with saved ‘sortcode option is fixed. * NEW : A possibility to change language for Like button. * NEW : A possibility to turn off the display of the buttons. * Bugfix : The bug with upload custom image for button is fixed. * Changed : BWS plugins section. * NEW : The Spanish language file is added to the plugin. * Change : Code that is used to connect styles and scripts is added to the plugin for correct SSL verification. * NEW : Style for facebook button block is added. * Bugfix : Redirect to profile page bug is fixed. * Bugfix : BWS Plugin’s menu section was fixed and right now it is consisted of 3 parts: activated, installed and recommended plugins. * Bugfix : The bug of positioning in admin menu is fixed. * Changed : Facebook button plugin functionality was changed in connection with the change of Facebook API. * Changed : BWS Plugin’s menu sections was fixed and right now it is consisted of 2 parts: installed and recommended plugins. * Bugfix : Displaying of the icons is fixed. * The bug with the link to the settings page is fixed in this version. 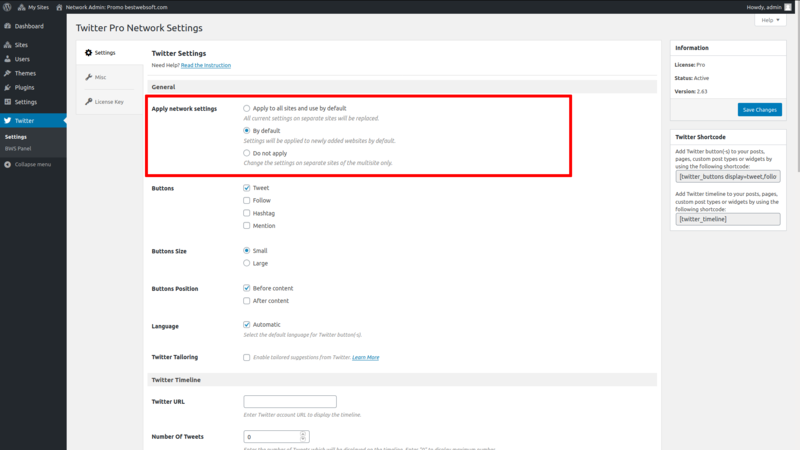 * Ability to install Facebook Button icon with a link to the account page, including settings adjustment functionality via WordPress admin panel.